An aphorism that Darius the Great instinctively understood 2000 years before Shakespeare wrote a truth that’s today but a misunderstood newspaper cliche. After seizing the Achaemenid throne and largest land empire of the ancient world in 521 BC, under somewhat murky circumstances, the new King of Kings began construction of an imperial capital befitting the glory of the Chosen of Ahura Mazda. 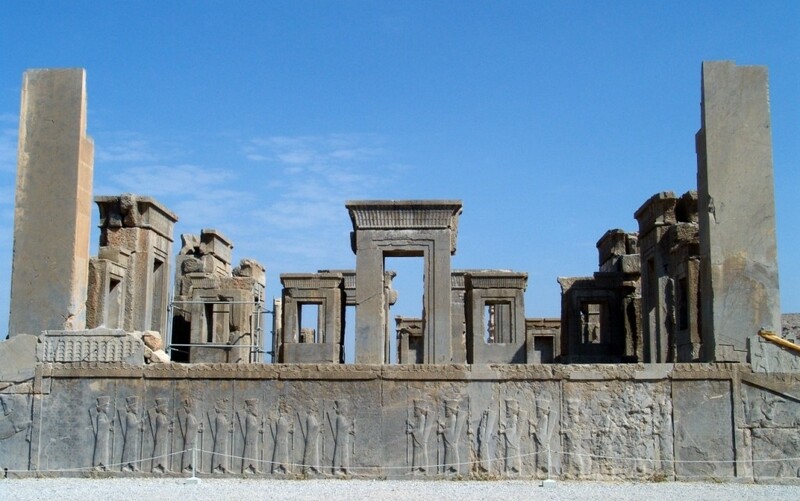 This lecture will examine the inherent theatricality of Darius’s palace-city of Persepolis – added to by all his successors until the site’s destruction in 329 BC at the hands of Alexander the Great. The glorious utilisation of sculpture, colour and luxury at Persepolis was designed to convey the Achaemenid’s own sense of themselves as saviours of the world and this lecture will bring some of their unseen splendour back to vivid life. A hidden valley-sanctuary of a persecuted Islamic sect located in the deep Sahara of southern Algeria, the M’Zab valley is the location of 5 fortress towns that until the beginning of the 20th century were entirely closed to outsiders: Islamic Algerians and French Christians alike. Today, the “Moazabites” or M’Zab Ibadi muslims are a dynamic minority community with a reputation for hard work and strict religious and social custom. This lecture will examine the extraordinary history of the M’Zab peoples through the prism of their equally extraordinary and beautiful artistic traditions.